Aspects of Learning and Memory provides information pertinent to the fundamental aspects of learning and memory. This book discusses the various problems of memory. Organized into eight chapters, this book begins with an overview of the different kinds of learning. This text then discusses the concept of memory, which is extended to include the capacity to retain learned skills, such as reading, wring, or driving a car. Other chapters consider the mechanism by which humans recall the past is frequently a process of matching a present image with a past image. 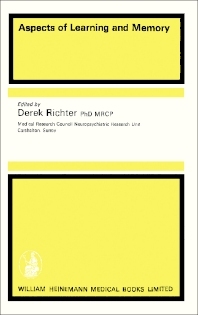 This book discusses as well the physiological mechanisms associated with learning and memory, which involve the establishment of neuronal patterns that can be reactivated at a later date when remembrance occurs. The final chapter deals with complexity of changes involved in learning. This book is a valuable resource for psychologists, clinical neurologists, pathologists, and scientists working in different fields of research.